I’m going to step out on a limb here and say that Brian Wood might be the most consistently excellent writer in comic books today. And although Northlanders has gotten no small amount of critical acclaim and positive reviews, it’s definitely not enough. In a world where great comics get cancelled left and right, it’s a good thing to have such a well-done book be out there getting better with every arc. 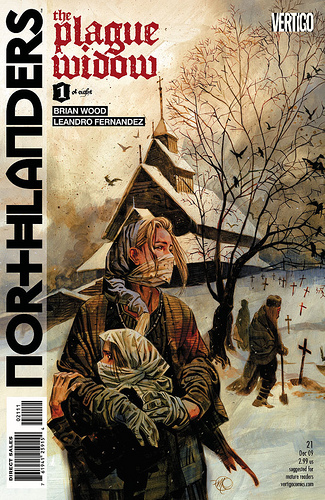 For those of you not in the loop, Northlanders is a comic book about vikings. Each arc tells a different story featuring different characters, but the gist is always about vikings. Actually, it’s not. The gist is stories. Compelling, tense, drama-filled, stories. That happen to be about vikings. This arc is about Hilda, a woman trying to get her daughter through a plague ridden winter in 11th Century Norway. This story is about as good as dramatic comic books get these days. Not only that, but in a series blessed by great artists, Leandro Fernandez stands out, with significant emotive skills. This is one to get, and it’s definitely on my short list for best unlimited series of the year. 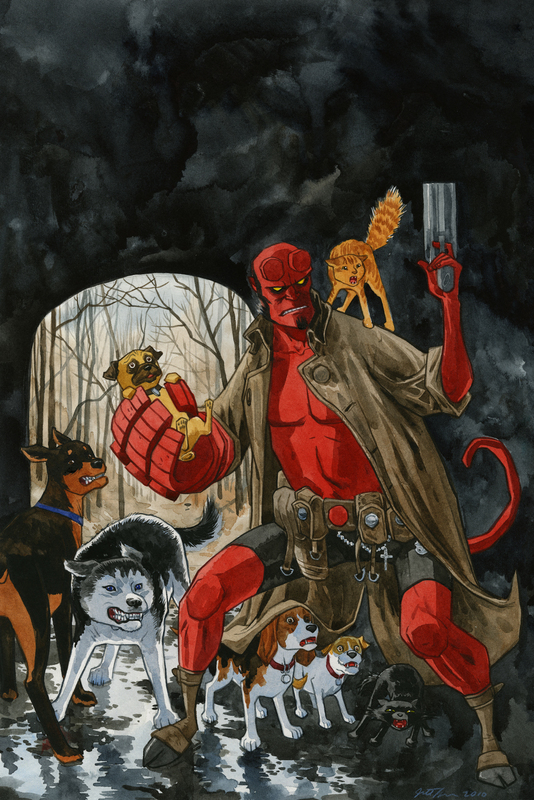 Hellboy/Beasts Of Burden – One Shot by Jill Thompson and Evan Dorkin. For those of you who are new: Hellboy is a demon that investigates and battles with creatures of supernatural evil. He was created by Mike Mignola. The Beasts Of Burden are a group of talking dogs and cats that investigates and battles with creatures of supernatural evil. They were created by Evan Dorkin and Jill Thompson. In this issue, they team up to investigate and battle with creatures of supernatural evil. This was a little goofy, but still fun. I liked how easily Hellboy accepted the dogs, since in a world where Rasputin’s ghost is your arch-nemesis, talking dogs is probably not even close to the weirdest thing Hellboy sees in an average day. This was definitely more of a Beasts story than a Hellboy story, but I wouldn’t recommend it as a jumping point to either character. Great for fans, but if you’re new to either mythology and want to know where to start with these characters, check out the fantastic Beasts hardcover that came out earlier this year, or one of the many top-notch Hellboy collections on the market. Still, Dorkin and Thompson have delivered a charming little story, and I recommend this to fans of either character. 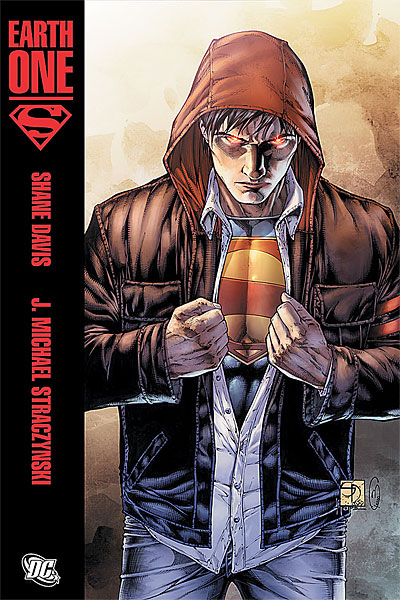 Superman – Earth One by J. Michael Straczyinski and Shane Davis. His parents wrapped him in this hoodie for the voyage to Earth. This project has been in the making for over a year. It’s essentially a reimagining of the Superman origin by superstar writer J. Michael Strazyinski, and up and comer Shane Davis. However, this origin isn’t a new one, it’s an “alternate” one, which means that it doesn’t really “matter” in the great continuity shitpile that is DC comics. So why should you read this? Well, I’m not convinced that you should. I have no problem with someone messing with one of the most iconic origins in comics IF they have a new and interesting approach to the character. And while JMS’ approach is new, I can’t necessarily say it’s interesting. This is JMS’ story of how Clark Kent became Superman, and I’m really not sure what the point of this was. Although there are a few interesting choices (JMS’ Jimmy Olsen might be the most interesting version of that character I’ve ever seen, and an alien invasion being the trigger that turns Clark into Superman is an idea so brilliantly simple that I can’t believe no one has thought of it before), I can’t say that there’s enough of a new approach to convince me that this “new” Superman is worth investing in. To top it all off, this Superman isn’t the strong, confident leader of men that we’ve come to know, love, and possibly snicker at from behind his cape. This Superman is conflicted, a little greedy, and wouldn’t be out-of-place playing drums for My Chemical Romance. Those are all interesting character traits to have, and definitely worth reading about. But not in Superman. That’s the whole point of him. If I want to read about heroes that doubt themselves at every turn, I’ll pick up a Marvel book. I’m aware that sounds like this is awful. It’s not. It’s an entertaining Superman story. But a $20 Hardcover standalone graphic novel written by one of the biggest stars in comics should be absolutely amazing, not just a decent read. This entry was posted in Comic Books and tagged Beasts Of Burden, Brian Wood, Hellboy, Northlanders, Superman. Bookmark the permalink.